Sleep is very important for the body and not getting enough can be detrimental to a person’s health. Alongside a bad mood and a lack of focus, lack of sleep can increase the risk of obesity, heart disease, diabetes and shorten life expectancy, according to the NHS. It’s recommended a person gets around eight hours of good-quality sleep a night. So what can you to make sure you get the sleep you need? What you eat can be extremely beneficial in providing good quality sleep, says the National Sleep Foundation . 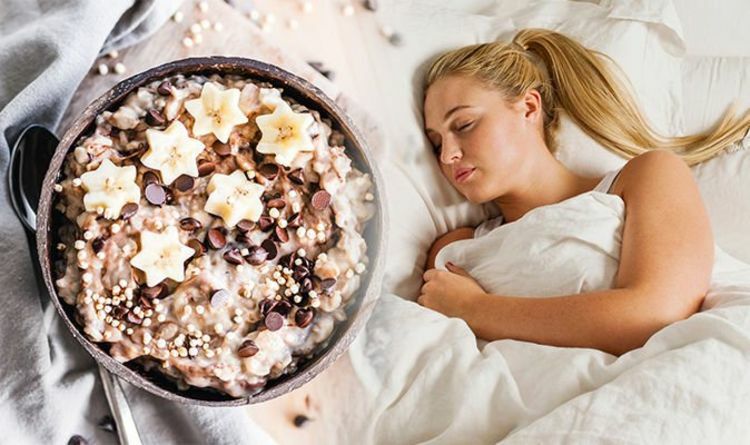 Three foods which have been proven to be sleep inducing are milk, bananas and oatmeal. Milk contains the sleep-inducing amino acid tryptophan. In one study (‘Effect of melatonin-rich night-time milk on sleep and activity in elderly institutionalized subjects’) milk was shown to improve sleep, particularly when taken alongside melatonin and exercise. Melatonin is a hormone that regulates sleep-wake cycles and can be found in fruits and vegetables, grains and nuts and seeds. Bananas also contain tryptophan and are a good source of magnesium. The Sleep Doctor, Michael J. Breus explains the role magnesium plays in sleep on his website: “Maintaining healthy magnesium levels often leads to deeper, more sound sleep.